Preventative Search and Rescue (PSAR) programs exist at many popular US National Park and US National Forest trailheads. The concept is simple; the impact is significant. Volunteers and in some cases uniformed rangers are present during peak use periods to provide information on trail conditions, weather hazards, wildlife, proper hydration and personal safety. Each Friday, Saturday and Sunday morning a team two to four volunteers sets up an information station at the trailhead. A weather board and tables are set up with information pamphlets, maps and a variety of Forest Service “swag” such as Smokey Bear stickers and booklets for children. 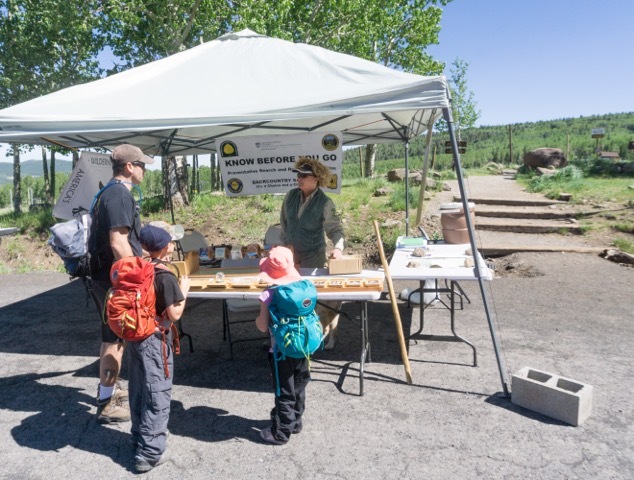 One or two volunteers remain at this station for four to five hours greeting hikers, providing safety tips to enhance their experience of the wilderness and offering alternative trail options for those seeking less strenuous activity. The other members of the team venture out on the trail meeting visitors along the way, offering information regarding trail conditions, advice on weather and sometimes assisting with minor first aid issues. To assist in this program requires only a willingness to engage forest visitors. Talking points are provided and all materials are available on-site. FoNAF provides on-the-job training and a vest or uniform shirt that identifies the volunteer as a representative of the FS. An on-line sign-up is available so that team members can select specific days to participate. To contact the PSAR Coordinator for more information click here.